The green thumb went out and built these potato mounds last weekend. They are already showing growth out the sides, and are looking very promising. Just a bunch of mulch and compost layered up with potato starts. 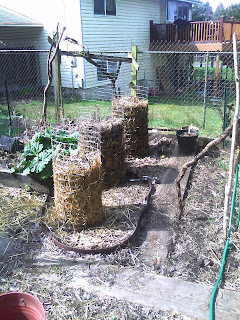 The mulch is straw and bunny poo, bunnies are amazing sources of nutrients (for the garden and the kitchen). Everyone should have a couple bunnies.